"All that is fine. But, why the bike?" Every biker gets asked this question! Truth be told; there are dozens of reasons why a person falls in love with cycling. There can't be any one post that can capture it all. Anyway, here's my 'top 5 reasons why we ride; and you should too'. We ride because it is hassle-free.It is the unhurried way of commuting and can often get us there faster. We ride for health & fitness. We ride to remind ourselves that we still-can. We find pleasure in the cool breeze against the sweat on our face. Actually, we go all out to seek it. We are adventurers.We ride through the woods, down the trails, over the logs, in the slush, on the gravel and pretty much everywhere else. We are not afraid of either getting dirty or totally drenched. Be it rain or shine, we always ride with a smile. We ride because it is often the journey that is more enjoyable than the destination. We are connoisseurs on two-wheels.We get up early, pedal our way to that perfect place to enjoy the sunrise. We slow down to listen to the chirping of birds and enjoy the masterpiece of white clouds against the big blue canvass. There is something about that sunset-ride along that beach that intrigues us every time. We are explorers on two wheels.We ride to discover new places and re-discover the old ones. We are curious about the local history, culture, art and cuisine. We ride to discover the little-known secrets and gems within our wonderful cities. We meet like-minded people, make new friends, exchange stories and few laughs. We climb the mountains.There is something about the hairpin bends; and the view of the city disappearing beneath you. Do you remember what Sir Edmund Hillary said - ‘It is not the mountain we conquer, but ourselves’. We ride to prove him right. We simply love our ride.Our uncomplaining companion has led us to new possibilities. When we ride, we find people friendlier, outdoors more vivid and the world in general becomes a tad brighter. In short, we ride because it’s just too much fun. Do you agree with my top 5 reasons? Do share your top reasons to ride. 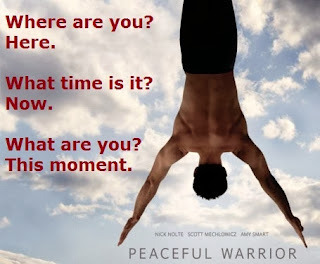 There ain't no journey what don't change you some - Cloud Atlas. Let me lay it down nice and straight. I’m an addict for the concoction of motorcycle and open highways. There is no denying it. It’s been so for quite some time now. What started as fun and adventure did take a rather serious turn. In a matter of few years, the esprit-de-motorcycle evolved from being a passion to an insatiable craving for something bigger - an instrument of freedom, a sense of individuality and a elixir for solitude. It is said, “If you want to be happy, ride a motorcycle”. I was craving for the sort of bliss that stays with you for 8 hours a day uninterrupted for 14 days in a row. 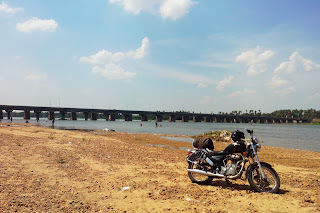 In September 2013, I did the Kashmir to Kanyakumari (K2K) solo motorcycle road trip. A long cherished dream and a favorite item from the bucket list. This ride has all the right motivating factors. Motorcycle: Blackbird (Well, every biker has a name for his bike) has been the great love of my life. 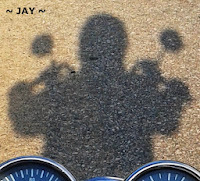 Solo: Long distance solo rides gradually develop a certain degree of courage and individuality. Helps you make peace with some of those unsettled thoughts, lends valuable perspective on life & quality living. YOU are the one person YOU ought to know well in life. So, as I kick started the bike, I hoped that the journey would be two-fold; of self exploration and at the same time firsthand experience of the Incredible India. And of course, I had to find the answer to the million dollar question. “What will break first. My back, My bike or My spirit?”. The awe and bliss of this ride unlike anything else I’ve been through till now. I must tell you that some experiences are so majestic that they can neither be articulated nor imagined. One can only live them through. 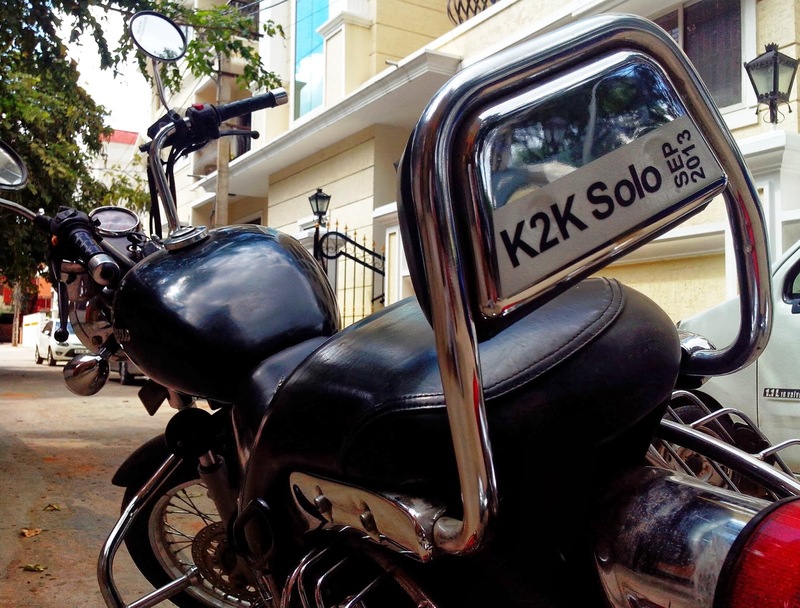 #K2K #Solo #RoyalEnfield is definitely one of those things. So, I’ll just elaborate on some of the merits & nuances of K2K solo ride; hoping to inspire some of you. The ride from Himalayas to the Indian Ocean is challenging, inspiring and scary; all at the same time. It’s an in-person exploration of the rich pluralism of our country and the delicate fabric that binds it together. I can’t tell you what is more charming; experiencing the vibrant & endearing diversity or exploring the delicate similarities every day of the ride. Truth be told, these delicate similarities are what makes up India. Without them, we would be just be 20 odd countries speaking a different tongue and following different traditions. Think it over. On the K2K ride, you see a lot of things change on a daily basis. In each state/region, you’ll find a different terrain and weather. The local cops wear a different uniform. The women dress differently (men don’t have much of an option anywhere). The name plates and signboards are in a different language. The local rickshaw/tuk-tuk looks different each day. Something as simple and ubiquitous as tea/chai tastes differently all along. It is quite amusing that your mobile phone service provider will welcome you to a new telecom circle every day. If the slideshow isn’t rendering correctly, try this link. Do explore them and let me know your thoughts in the comments section. Most people are convinced that long distance SOLO biking is a colossal-bore and that such an endeavor interests only the lonely souls. They say, “Why would anyone go out ALL ALONE while you can go out with family and/or friends”. But, very little do they know of finding peace in silence or the bliss in discovering oneself. Far less do they understand that biking is a two way journey; you’re traveling further along the road and at the same time delving deeper into yourself. People whose sense of SELF is defined by materialistic things and other people do not very well comprehend the metaphysics of biking. So, this post is not for them but for you. Here are some of my learning along the long road. If I were allowed to pursue one and only one virtue of biking, it’d be this. “Ride slow. For faster you ride, less you witness and lesser you’ll experience”. Let me highlight the technicality; the bliss of self-actualization trumps the fun in burning adrenaline any day. Hands down! Now, let me elucidate the same in layman’s tongue. If you’re riding too fast, all your attention & energy is spent on NOT falling down than on actually enjoying the ride. You’re gripping the handle too tight, you’re pressing your legs into the fuel tank; you’ve lowered your head and forced yourself to see nowhere else but the road ahead. So, instead of a fulfilling and enriching experience, you’ve merely managed to come out alive from a self imposed risk. I’m told that there is a certain degree of sportsmanship, competitiveness, discipline and focus required in motorcycle racing. Well, I say that this situation is akin to drowning oneself in alcohol and then competing to remain focused. There are competitions that drunkards play and there is motorcycle racing. They are guilty pleasures in self inflicted chaos. I ride my bike for another thing altogether. I seek an endearing & liberating experience. I ride for a blissful journey through clarity & awareness; not a survival mission through danger and chaos. Also, think about it. Faster one rides, sooner he gets tired and distracted too. If you’re riding at 120 kmph, you’ll hardly notice the paddy fields along the road. However, if you’re riding at 80 kmph, there’s a good chance you’ll smell the moist air, notice the different shades of green and even spot a farmer or two aging about their chores. Needless to remind, if you ride responsibly; you’ll live longer and actually get to ride lot more. For long man has been a confused creature. Every single one of us has a mistaken identity. We form a complex idea of who we are based on what we were yesterday and what we dream of being tomorrow. We’re struck too badly in the unforgiving past of the dreamy future. Little do we realize that both of them don’t matter and ruin our present with the burdens of the past and the uncertainties of the future. The faculty of living in the absolute reality; the here-now eludes most of us. However, I think there is a close approximation to this absolute reality. There is one thing in life that treats you to your face value. It does not care who you are, what you did, or where you’re headed. It’s the open highway. On an open highway, you’re judged not by your past and weighed not by your intentions. The open highway does not discriminate; you’re handed just as much luck as the other guy. Nothing less, nothing more! 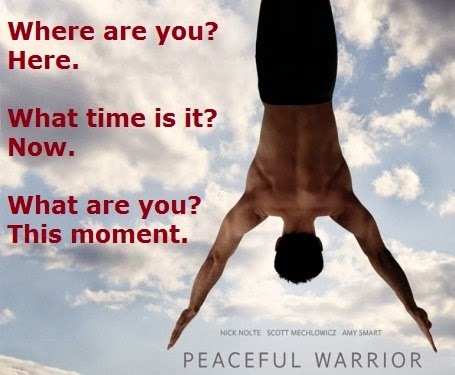 You’re tested for awareness & responsiveness every moment. It’s funny that the punishment and reward is the same – life! 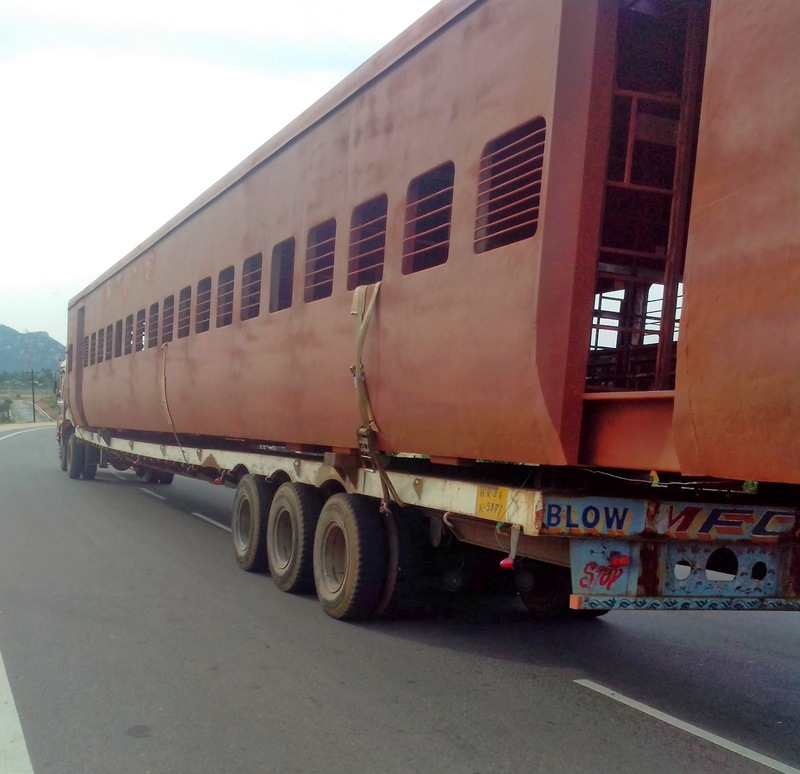 Couldn’t it be that one lives in the here-now on an open highway? 3. Reset your senses K2K ride helps you discover the multitude shades of green and blue that you did not know existed. It’s a full blown awareness of the entire color spectrum. The interplay of colors is so amazing that it’ll make your 1080p television look like pencil sketch. Keep your eyes open, ears attentive and smell the fragrance of the fresh air. Lose those goggles and iPods. You have something more majestic to experience here. It’s the ultimate reset option for the five senses. Did you know that the air smells differently while you ride along the sugar cane fields and paddy fields? The air always smells of dampness over the paddy fields. Did you know why? Or more importantly have you ever cared to notice? 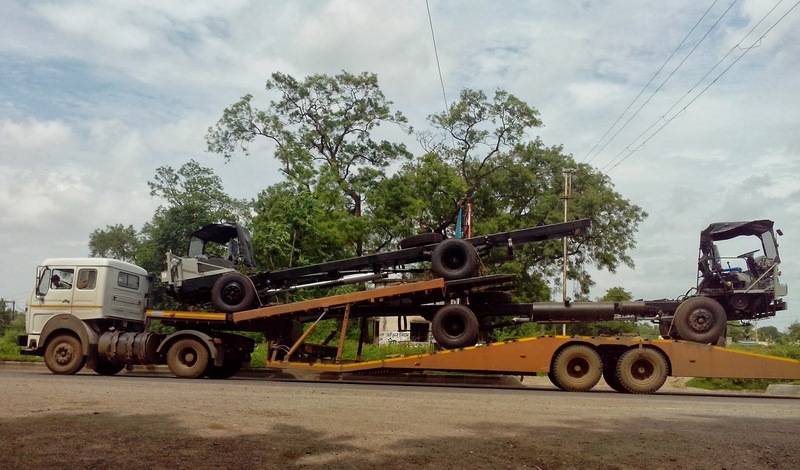 One more thing that you can’t miss on K2K ride is the TRUCKS. In a matter of 10 days or so, you’ll see more trucks than you’d have seen in the last 10 years. Trucks in India transport everything and/or anything than needs transportation gets dumped on a truck. 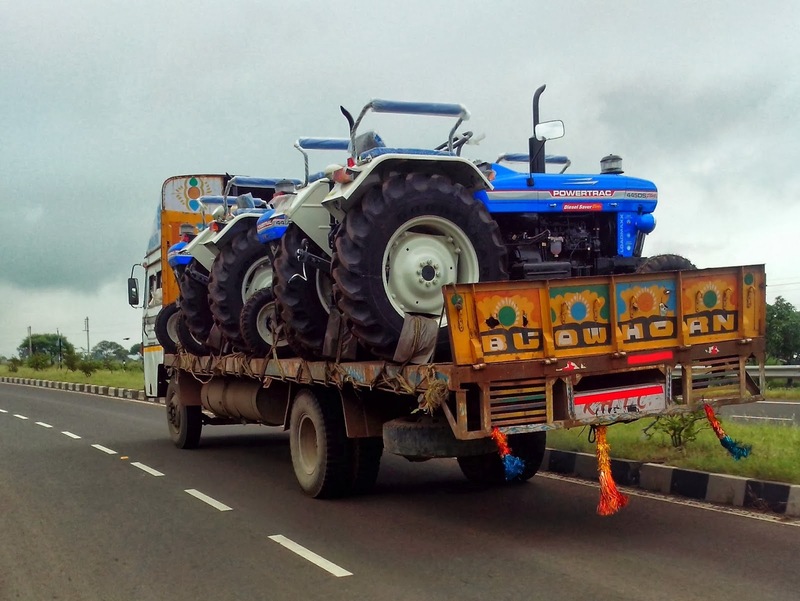 While you’re struck with the great Indian truck rally, might as well get some laughs out of it. 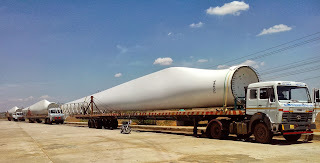 140 feet truck. Notice my bike in the pic? I wouldn’t comment on their driving sense, but truck drivers surely do have a good sense of humor. Next time you’re bored, try reading the quotes inscribed on them. You’ll sure in for some enlightenment and entertainment. Well, what’s wrong with indulging in a little bit of humor coupled with Bollywood stardom? Here’s some to get started. 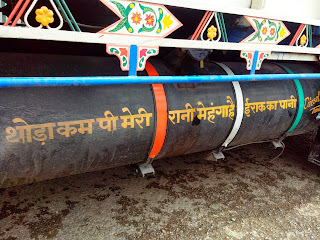 Rajesh Khanna Moment: I was riding along Malegaon-Shirdi highway chasing a goods train all along. I couldn’t help humming, ‘Meri sapnon ki rani kab aayegi tu’. 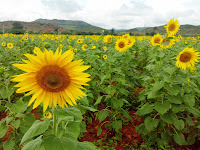 SRK moment: The sunflower fields were in full bloom. But then, Simran was missing. So were the cows and the bell. 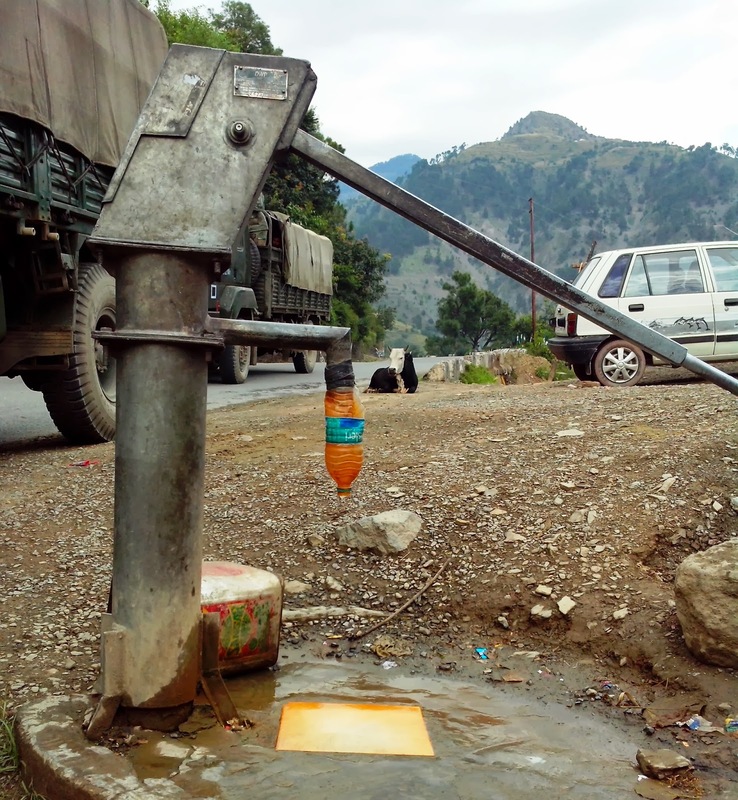 Sunny Deol moment: That is a fine handpump along the Indo-Pak border. I wasn't Bollywood-enough for uprooting it with my bare hands. But, I did stare at that innocent structure laughing for a while. 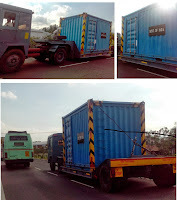 Dhoom Moment: A Govt of India safe was being carried with minimum security. I was on my bike, tempted, followed it for quite some distance. In the end, I told myself, "Sour Grapes" and moved on. Maybe another day, a fancy mask and a faster bike; things could've been different. 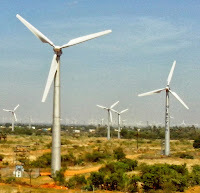 Dhoom..Dhoom..
Don Quixote moment: I am not Quixote-enough to charge windmills. But yes, did manage to see a lot of them along the ride. If you come across a river bed like this; don’t be a douchebag and ride along. Get down, do some dirt/sand biking and convince yourself for some cleansing. In scenarios like these, people don’t really care for the right costume. Once you get past the customary broken beer bottles, you’ll actually realize that the water is lot cleaner than you thought and definitely more rejuvenating than your swimming pool. Spend some more time. Try swimming against the current. There’s a good chance, you’ll find some kids playing in the vicinity. Teach them a trick or two of yours. Learn one of their own. I’ll assure you, by the time you get out, you’d have lost whatever little back and neck ache. You’ll even come out with a big grin plastered over your face. Nothing can be more boring than being handed out a tourist brochure to explore the place. Pleasant surprises are a better idea. Here's my top 3 discoveries/realizations along my ride. 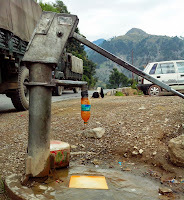 Cricket bats town: There this little town/village along the Srinagar-Jammu highway. It seemed as though all the shops in the road sell one thing only - Cricket bats. Pathankot, PB (Camo Goods): There's a particular street in Pathankot, where you get plenty of camouflage gears - the whole range. You name it and they have it. All at wholesale prices. 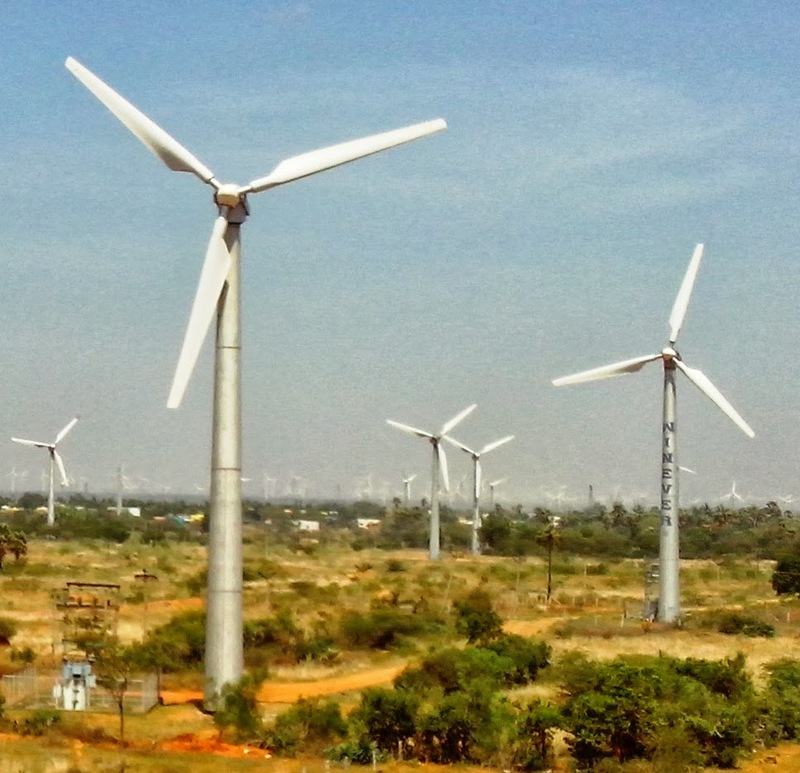 Kumarapuram, TN: This little town is located at an hour's distance from Kanyakumari. It seemed as though this is a town of windmills with few humans and not the other way around. It seemed as though there ere more windmills in the town than people and cattle put together. The localities told me that the blades of the wind mills never stop rotating in this town. Quite a place, I tell you. Wishing you a long and blissful ride. May the force be with you. Let me know your thoughts about the post and solo riding in the comments section. 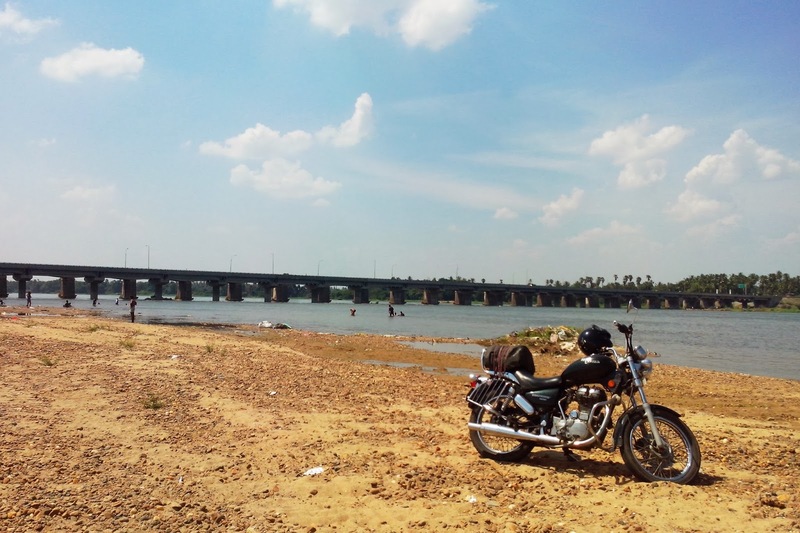 In September 2013, I did the Kashmir to Kanyakumari (K2K) solo motorcycle road trip. A journey from Himalayas to the Indian Ocean, covering 5,043 kms in 14 days on my RE Thunderbird. Click here for ride pictures and additional info. The K2K ride took me through nine states and the rich pluralism all along. One can’t help feel the fragrance of the terrain, weather & culture all along. The good thing is, some of that fragrance clings on to you for the rest of your life. Next time you think about a particular state/region of India, you’ll recollect and remember with absolute clarity, what it meant to be there. How the air smelled there, the landscape, the crop fields, the weather, how the local language sounds. Here are my observations about the terrain, roads and traffic in each region. This is undisputedly the most scenic and beautiful landscape in the entire trip. Let me put it this way. Kashmir is lot more than the amplified version of the most scenic dreamland you can imagine. This terrain has pretty much everything that you can stare and awe at. Kashmir has mountains, valleys, waterfalls, gardens, lakes, rivers; and all of them unlike anything else you’ve seen before. As you’d be aware, these mountain ranges are the biggest in the world. The rivers are mighty and lakes so big that you’ll feel like a Lilliput in the Eden Gardens. The road from Srinagar to Jammu (NH 1A or NH 44 of about 300 kms) is replete with the most awesome view possible. These roads built by Border Roads Organization (BRO) takes you through valleys, dam, waterfalls & tunnel (Jawahar Tunnel is 2.5 kms). The view is so good that I was tempted at least once every minute to take pictures. Contrary to my expectation, it’s a very busy road with heavy traffic. Army convoy forms the most ostensible contributor to the traffic. Dream over. Kashmir has passed. Wake up. 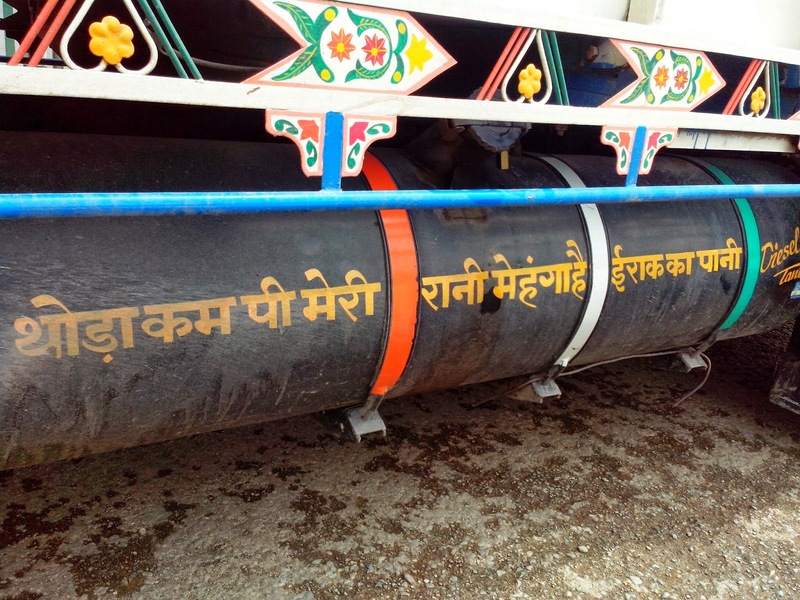 Wake up to the great Indian TRUCKs. This stretch gets you on a psychological overdose of trucks. I swear, I saw more truck in 5 days of my ride than in the last 10 years of my life. Trucks of all brands, age and size carrying just about everything. You name it - Food, Cattle, People, Cargo, Construction material & Automobiles. For several hours you’ll find no other vehicle other than trucks. This stretch is also an overdose lush green crop fields. I’d never witnessed such lush green spreading as far the eye could see. Also, when in Punjab, drink lassi instead of the tea. The assault of the trucks continues. However, the intensity reduces. Roads are good all along; the highway occasionally crossing through the irrigation channels. However, the terrain gets increasingly devoid of vegetation as you get close to the National Capital Region (NCR). Don’t bother asking anyone. Every hillock in this region seems to either have a shrine or a fort atop it. And they are somehow linked to Ramayana, Mahabharata or at least, Indian independence struggle. Explore as many as you can. At times, the stories can get real funny and interesting. Needless to say, look out for the camels too. The roads are as good and wide they can get. By now, the amount of trucks on the road too comes down to a psychologically healthy number. Welcome to the lands of Misal Pav, Kanda-Poha and Bhaaji-Pav. 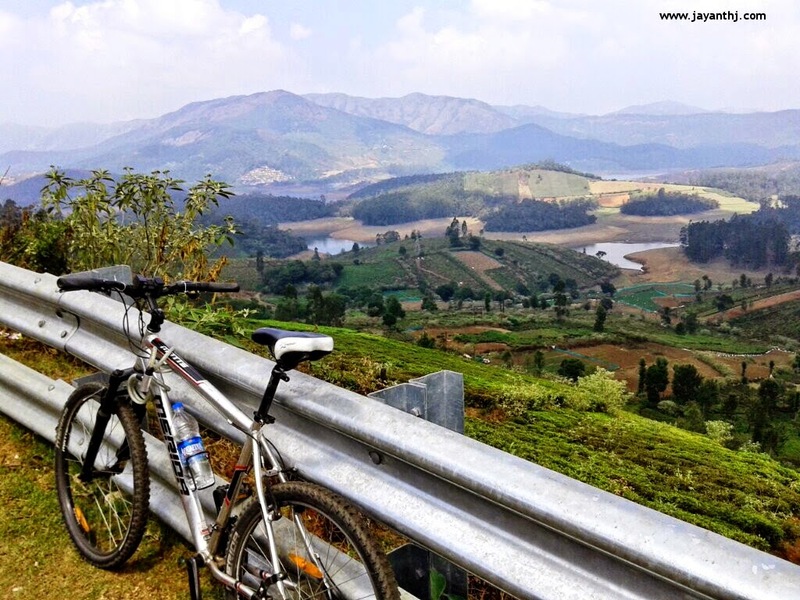 You’ll come across some interesting terrain; gorgeous valleys with steep incline/decline of the roads. This stretch also takes you across some of the big rivers – Narmada, Tapi and their tributaries. The Malegaon – Shirdi stretch is a single road with two-way traffic and NO divider. The roads aren’t too good and drivers too aren’t very courteous. I have a hypothesis that drivers of pilgrimage cabs everywhere have too much faith in their deity. So much so that they put it to test with passengers’ lives over narrow curves. If Kashmir-Jammu highway has the best view, this stretch gets the distinction for the ‘best maintained divider’. The NH 4 is perhaps the most scenic highway in central-south India wherein even the divider is competing for your attention. Among the highlights are beautiful one-way curves, a tunnel and in a certain stretch, road that is dead-straight. One can literally see the straight road ahead for upto 5 kms (or until the horizon). Master Yoda says, “May the Idli-Sambhar, Dosa and Pongal be with you”. Around here, coffee and tea will be served with sugar. But, thou shall stir it yourself. TN is the homeland of Rajnikant and Royal Enfield. Thou shalt pay thine respects to both the Superstars. Coming back to our ride; one can’t ask for better roads. This stretch is also temple and pilgrimage fest all around the year. As you get close to kanyakumari, even though you cant see it yet, you can hear the ocean. That damp and moist smell of the sea rings those jingle bells in the head. I couldn’t help recollect the golden words of RED from the Shawshank Redemption and make few of my own customizations. Fortunately, none of them did break. Unfortunately, the elusive question endures. I will to seek my answers another day.